SIM PIG is compatible with most mobile phones including the iPhone (up to and including firmware version 2.1), HTC (Not Trinity), Nokia E and N Series and the top of the range Sony Ericssons. Installation of SIM PIG is simple and can be done in no time at all. 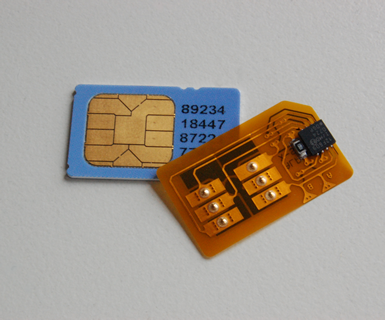 Step 1: Depending on your handset SIM card tray, you may need to trim a small part of your SIM card. Nothing to worry about or too technical! Simply take a pair of Scissors and cut the angled corner of your SIM to make the corner a little larger to allow for the smal chip on SIM PIG to fit in the SIM tray. Step 2: Align the SIM PIG chip with your SIM card. Step 3: Carefully insert the SIM PIG chip and SIM card into your handset and that's it. You can now use your SIM in your locked handset. NOTE: The iPhone the tray is quite "snug" and we recommned you put a small pieice of tape on the SIM to allow easier removal at a later date. Although this is not essential, it might help.